The day after our last talk of the year, we were lucky enough to be back again in the gallery for a free lunchtime talk with Curator Sophie Cummings, with I think a record number of people attending. After the talk, people continued to look at the exhibition. Curator Sophie Cummings gave us a wonderful tour of the new Paper exhibition at lunchtime on Friday 1 December. The lunchtime talks are free and start at 12.30pm and last half an hour, with time for questions afterwards. They are well attended and extremely enjoyable and informative. and below talking about Nicholas Munro's 'Igloos'. Above John Nash's 'Buoys at Harwich' painted c 1955, it's watercolour on paper, and below 'Grey and White Drawing' by John Walker in 1965-6. It's an amazing piece, the way it's executed makes it look like it's made form many different pieces of paper, but it's a clever optical illusion. Below 4 pieces by Cecil Collins, Head, Head, Sun Head and Studies. Below this is Goshawk by Charles Tunnicliffe it's a wood engraving on paper. Those pieces with a hashtag beside them are examples of pieces from the Meryl Ainslie Gift, an anonymous gift of fifty works on paper given in tribute to the artist and gallery owner Meryl Ainslie. The next FREE lunchtime talk will take place on Friday 15 December at 12.30pm and will look at the Janet Boulton exhibition. On Wednesday 29 November from 6pm, there was a Private View of the two new exhibitions which had just opened, were very well attended and we had a wonderful evening. Works on paper are some of the most fascinating examples of modern art. This exhibition features drawings, watercolours and prints by modern and contemporary artists and demonstrates the huge range of effects that can be created using paper and imagination. The exhibition celebrates the recent Meryl Ainslie Gift donation – a group of more than 50 works on paper given anonymously to Swindon in 2017 in appreciation of Meryl Ainslie’s services to the Arts. Meryl Ainslie MA is founder of Rabley Drawing Centre, a gallery and drawing school located near Marlborough which specialises in drawings, works on paper and original prints. She worked at Swindon School of Art between 1993 and 2004 and was instrumental in the development and delivery of the successful higher education programme in Fine Art Drawing. The exhibition features works by Allen Jones, Nicholas Monro, Michael Ayrton, Basil Beattie and Katherine Jones. These are displayed alongside prints by Ian Hamilton Finlay, Eduardo Paolozzi and Cecil Collins, and drawings by George Clausen, Gwen John and Augustus John. Janet Boulton is internationally known for her watercolours and paper relief works, but few know of her connections to Swindon. This exhibition celebrates her works on paper and will include paintings inspired by music, still life and gardens. This exhibition is a welcome return to Swindon from this important artist. It celebrates both her innovative use of watercolour and her engagement with nature, beauty, architecture and music. We were very fortunate to have Richard Morphet giving an opening speech. Richard seen below is known for his long association with the museum, for many years he advised Denys Hodson about acquisitions for the Swindon Collection. The Paper exhibition continues until 10 March, and Janet Boulton's exhibition continues until 20 January. Don't miss the in conversation with Janet Boulton and Sophie Cummings on Thursday 14 December. 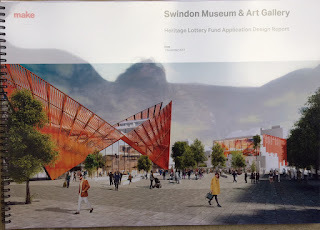 On Wednesday 29 November, members of the Trust were asked to attend a photoshoot at the Civic Offices in Euclid Street, to celebrate the delivery of the newly bound copies of the Bid for the new Swindon Museum and Art Gallery to be delivered the following day to the Heritage Lottery Fund offices in Exeter. Several photographers spent about half an hour getting Rod Hebden to pose with a wheelbarrow full of postcards with a line of us behind him and on the steps of the Civic Offices, which posed a problem for leader of the council David Renard, because being taller than most of us had to stand on a low step at the front of the group. We held copies of the Bid above our heads, we cheered and generally did all the things we were asked to do, but I can't find a record in the media of any of the photos taken that day. The next day, Thursday 30 November, we supporters met outside the Museum to wave Rod Hebden and Paul Holmes off and wish them luck. Above Tom Seaward reporter at the Swindon Advertiser simultaneously photographing and interviewing Rod. I like this photo above because it shows Rod in action with a box of postcards!! 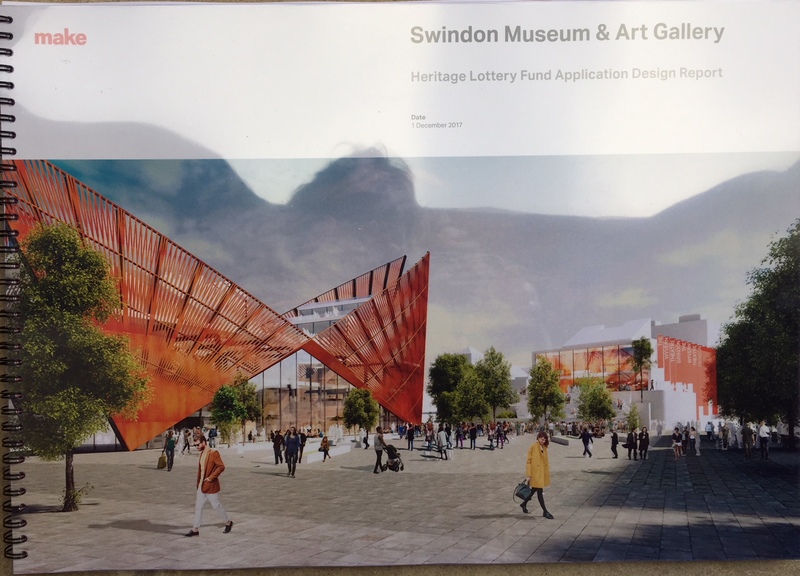 A selection of articles in the Swindon Advertiser and Rod Hebden's column have been very positive and informative,and show a selection of photos. There was also a handy 4 page pull out about the bid on 1 December,.